A new report into the financial impact of the McMurray fires says some $760m (C$985m; £528m) in oil sands production has been lost. The analysis says the blaze has meant the loss of 1.2 million barrels of oil a day over two weeks. The sum is equivalent to 0.33% of the province of Alberta's projected GDP this year, as well as representing 0.06% of the country's projected GDP. "These are big numbers," Kevin Birn, an analyst at IHS Energy, said. "The industry was already feeling the impact of a very low price environment in the first quarter of the year, with prices lower than in the rest of the world," he told the BBC's Bill Wilson. The analysis, by economic research organisation the Conference Board of Canada, projects that national economic impacts will be "minimal". He said the oil sands firms affected were among the biggest energy companies in the world, and that they would be "pushing to get facilities up and running as soon as possible". "Some facilities had already started ramping up ready to restart production, but have had to stand down again and evacuate workers. There is rain forecast for this weekend which will hopefully bring an end to this disruption." Mr Birn added that most of the Canadian sands oil produced was sent to the US mid-west for processing, and that a knock-on effect would be that refineries there would be having to look for alternative sources, "which comes with additional costs for them". The fire now covers 3,527 sq km (1,366 square miles) and conditions are getting more dangerous for fire fighters north of Fort McMurray. 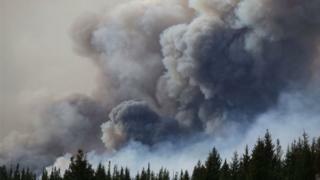 It is moving east and encroaching the border with Saskatchewan, officials said on Tuesday, and continuing to "burn out of control". 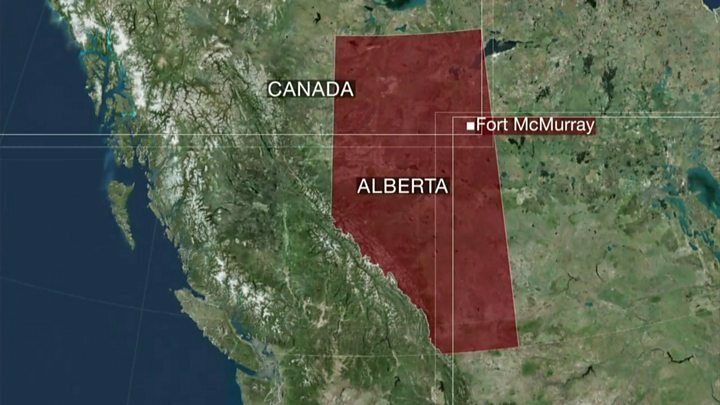 The Alberta government is taking a "second look" at plans for re-entry into Fort McMurray, said Alberta premier Rachel Notley. "We're not going to have people going back until we know it's safe," she said. She said said it is unclear when oil production can resume. Gas service has returned to 60% of the city and electricity is restored in undamaged areas, she said. Workers who were sent to Fort McMurray to begin working on the hospital have now been evacuated. Alberta Highway 63 is likely to be threatened and could be closed for a period of time, she said. Media captionIn some areas of Fort McMurray, houses have been reduced to nothing but ash. Canadian Finance Minister Bill Morneau told CBC News that the cost of the disaster was still being evaluated. "We're obviously going to stand shoulder to shoulder with the people in Fort McMurray and rebuild the city," he said. Are you an oil worker who returned to the area or in one of the camps? Have you been affected by the fires? Let us know about your experiences. Email haveyoursay@bbc.co.uk with your stories.